The Fruit Bat is a family of several species of bats that are sometimes referred as Flying Foxes. They have a life expectancy of about 30 years. They vary in terms of their length ranging between below 6 to 40 centimeters and weighing about 1.6 kilograms. They have large eyes with an excellent vision and sense of smell that they use in finding food and for their own protection. Their sharp teeth and long tongue enable them to feed successfully on fruits. The shape of their wings varies to adapt to the various sites and locations that they belong to and at times the different wing sizes and shapes has been attributed to their different feeding environments. Fruit bats are relatively large bats. Their wings are long fingers covered by thin skin, and the body is furry. Males and females look alike. Like all bats, they have weak legs and don’t walk very well. Livingstone’s Fruit Bat (Pteropus livingstonii, from Africa) is one of the largest fruit bats; it has a wingspan of up to 6 ft (1.8 m). The long-tongued fruit bat (Macroglossus minimus) is one of the smallest fruit bats; it has a wingspan of 5-6 inches (13-15 cm). 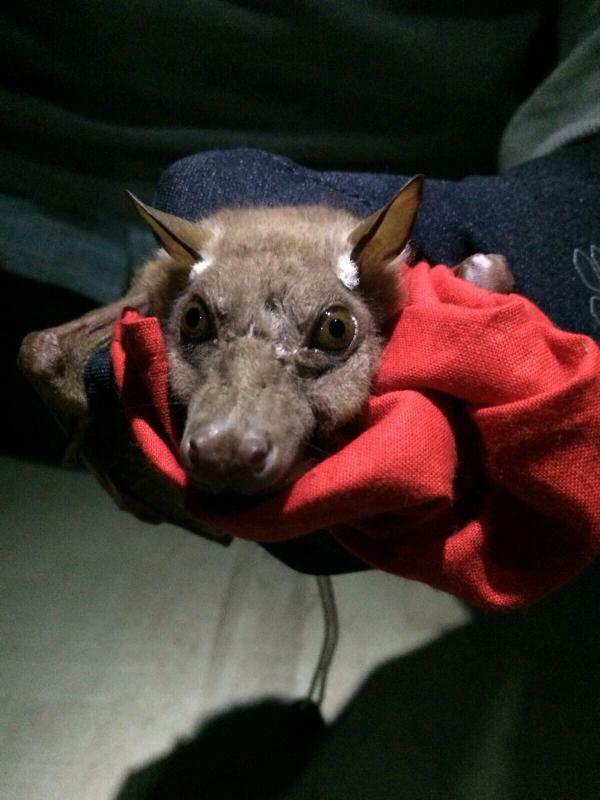 The wings of the Fruit Bat is an adaptation to allow them to fly, stay warm when roosting. They belong to large colonies referred to as “camps” which is a safety mechanisms and in every 8 females their can be 1 male. They feed on flower nectar and fruit juice. The Fruit bats live in dense forests in Africa, Europe, Australia, and Asia. They tend to thrive well in forested and grassland areas with a lot of food especially fruit trees, especially in areas with warmer climates which propagate variety of trees to grow throughout the year. In certain times of the year they can travel long distances to find food. When roosting during the day, they do so high up in the trees which provides sufficient darkness that protects against various predators, or hide in crevices or other dark areas and typically live close to water bodies. The gestation period of the Fruit Bat is about 6 months. After delivery the females nurture the young for a period of 6 weeks until the young is able to fly by itself. Some of predators for the Fruit Bat are: Birds (e.g. hawk, eagle), snakes, cats. Recent studies have demonstrated the potential of bats to act as reservoirs of zoonotic pathogens (as reviewed in Hayman et al.(2012). One example is the common and conspicuous straw-coloured fruit bat (Eidolon helvum), which has been identified by Banyard et al (2012) as a reservoir host for Lagos bat virus (LBV, family Rhabdoviridae, genus Lyssavirus) and henipaviruses (family Paramyxoviridae) by Hayman et al (2008) in mainland Africa.